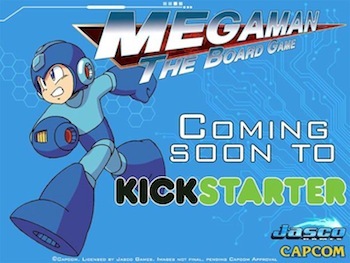 Official Mega Man Board Game Coming to Kickstarter "Soon"
And you thought Mighty No. 9 would be the closest thing to Mega Man you could fund on Kickstarter. A crowdsourcing campaign to fund an officially licensed Mega Man board game will be coming to Kickstarter soon, according to the game's Facebook page. Produced by card game-maker Jasco Games, Mega Man: The Board Game pits 2-5 players in a race to be the first to beat Dr. Wily. The set includes miniature figurines and a customizable card deck in lieu of dice. Capcom has demonstrated a surprising willingness to endorse all kind of third-party Mega Man projects recently. Last year, the publisher distributed Street Fighter X Mega Man, a fan-made PC mashup of the Capcom's two beloved franchises. Meanwhile, the Blue Bomber will return to fighting games as a character in Nintendo's upcoming Super Smash Bros. games for 3DS and Wii U. According to Facebook, the game is already in production, and Jasco expects to finish the game regardless of how they fare on Kickstarter. Jasco says the campaign exists as "a chance for fans to show their support and help us make the game better." Jasco plans to create expansion sets based on specific Mega Man entries after the game's release. Planned expansions will add gameplay for up to eight players, while adding new characters, weapons and levels. There is currently no official release date for Mega Man: The Board Game or start-date for its Kickstarter.